Jesmy Jose obtained her Ph.D. in Polymer Science from Mahatma Gandhi University, Kottayam, India. Prior to joining Trent, she worked as a Post-Doctoral Fellow at Université du Maine, Le Mans, France. She has conducted research work at several European laboratories. Polymer structure characterization is her forte. Currently she is working in the field of processing-structure-property relationships in Polymeric Biomaterials. AVT McCormick Ingredients Private Ltd.
ALIPHATIC POLYESTERS AND COPOLYESTERS DERIVED FROM NATURAL OILS AND THEIR RELATED PHYSICAL PROPERTIES. The Kerala State Young Scientist Award instituted by the Kerala State Council for Science, Technology, and Environment is intended to honor talented young Scientists of Indian origin in recognition of their outstanding contribution in Science and Technology. 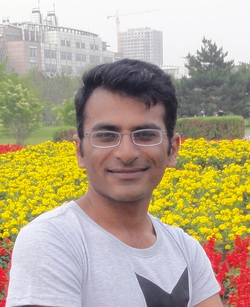 Syed Mazhar Shah got his Master in Analytical Chemistry from Institute of Chemistry, University of the Punjab, Pakistan in 2005. He joined the lab in 2008 for his doctoral studies. He is working on the preconcentration of heavy metals from environmental samples via cloud point extraction and solid phase extraction. His research is focused on the synthesis of magnetic mesoporous silica materials for adsorption and extraction of heavy metal ions. Huang Hui completed her master degree in College of Chemistry, Jilin University, and joined the group for her Doctoral research. Her major research areas include applications of water-soluble conjugated polymer in bioanalysis and bio-medical fields.‎She is currently a lecturer at the College of Biological and Agricultural Engineering, Jilin University. 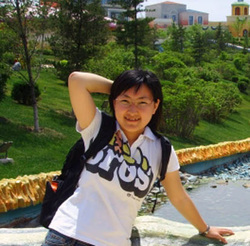 Gao Yuan joined the group for her Doctor degree in 2009. Her major research areas include applications of ‎graphene oxide in bioanalysis and biomedical. ‎She utilized graphene oxide as absorbent and drug carrier for purification and drug delivery. She ‎also designed a graphen oxide-based FRET sensor for bioanalysis.‎She is currently a lecturer at the College of Electronic Science & Engineering, Jilin University. Dr. Ma Qiang is currently an associate professor at the department of analytical chemistry, College of Chemistry, Jilin University. He obtained his PhD degree in Chemistry from Jilin University in 2008. His postdoctoral training was at the Institute of Chemical Research of Catalonia with Professor Emilio Palomares. His laboratory experience concerned the application of QDs and QDs-encoded microspheres in immunoassay. He is especially involved in the development of novel QDs-based biosensors and their applications to clinical diagnosis.